The Bible text is about the children of Israel and Moses as they sojourn out of Egypt through the Red Sea to the promised land. Moses job was a tedious one, he was sent to lead the people that were inherently stubborn. After he had communicated the message, they will leave him and go gather together and do something else (Exodus 32). The Israelites were a set of stubborn people but God mercies endureth forever. God hardened Pharaoh’s heart so that he would pursue the Israelites, at a time the Israelites were complaining “are there no graves in Egypt so much more than you want us to die here? ….” (Exodus14:11). Moses was caught amongst the children of Israel and God. The Israelites were very stubborn people as at the time, so it was difficult to do the job of Moses. The kind of people who witnessed the miracles and still were impatient to wait for Moses to come back from the presence of God (Exodus 32). In Exodus 14: 4 God said he was going to harden Pharaohs’ heart so that God could manifest his power. “And I will harden Pharaoh’s heart, and he will pursue them. But I will gain glory for myself through Pharaoh and all his army, and the Egyptians will know that I am the LORD.” So the Israelites did this. I tell you today do not pursue or go after God’s anointed. The consequences are great, an example is that which happened to the Pharaoh. Meanwhile, God will always take care of his people and look out for them. Maybe you are in a state where you have no one to turn to, no help, no one to borrow from, full of debts and do not how to move forward, you are by the red sea. God told Moses to move forward, even in the midst of the red sea. Have you been in a situation where you think there is no way, you evaluate your life and it seems no way, yet God says to move forward. Maybe you looked at yourself, it seems you cannot make it, you visited the doctors they said you cannot have children, God is telling you today, “Fear not”, “Stand still”. There are many situations people face today, I may not have mentioned yours, I do not know what your circumstances are but I know there is a God. The Bible says in Gen. 22: 1; God called Abraham and he answered, “Here I am..”; this happened because Abraham could hear his voice. I have been through the Christianity, from a worker to where I am today as an Arch Bishop. At a younger age, although born in a Christian home there was a moment in my life I knew I had to surrender my all to God, it had nothing to do with my Christian background. Even though I was born in a Christian home, something was still missing. I listened to a message and the message came to me and the question was “what next”? I pray for you today; may you not just be filling the church, may you have a relationship with Christ, so that when he says go forward, you will understand what he is saying and heed His voice. Exodus 14: 15-16 – “Then the Lord said to Moses, “Why are you crying out to me? Tell the Israelites to move on. 16 Raise your staff and stretch out your hand over the sea to divide the water so that the Israelites can go through the sea on dry ground”. If you think you are down God will lift you up. You have the rod right now in your hand, the rod is grace, the rod is the power of God, it is the word of God in you, use it and move forward. I tell you today, God is taking you to another destination, take your rod and move forward, stretch your faith, stretch the word of God. Use your faith, work out your salvation, whatever you do, you do for yourself and do wholeheartedly. There are some people who think doing the word of God is a form of getting popularity with the Pastor or pleasing the Pastor but I tell you today, whatever you do you do for yourself. God will remain God. Prayer: This red sea that is before me, father help me to stretch forth my rod and let every impossibility became possible in Jesus name, Amen. 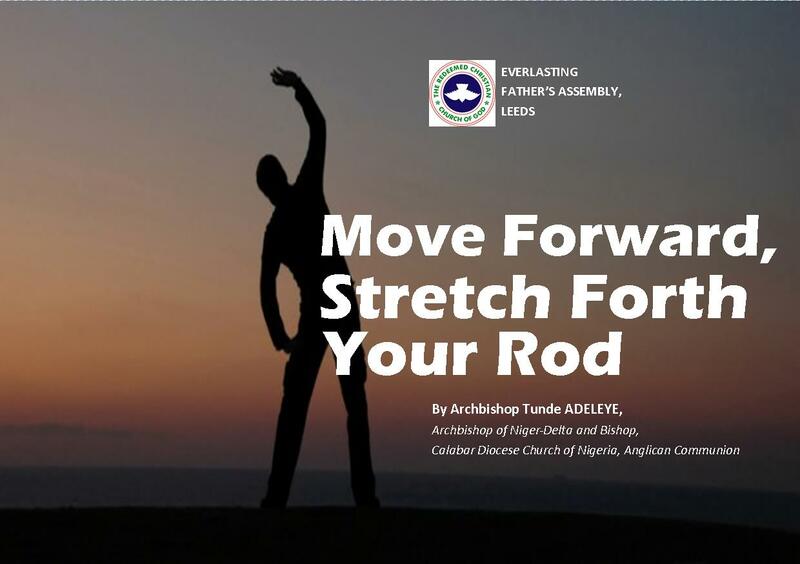 The sermon, Move Forward, Stretch Forth Your Rod, by Archbishop Tunde Adeleye, Archbishop of Niger-Delta and Bishop, Calabar Diocese Church of Nigeria, Anglican Communion, was delivered on August 19, 2018.